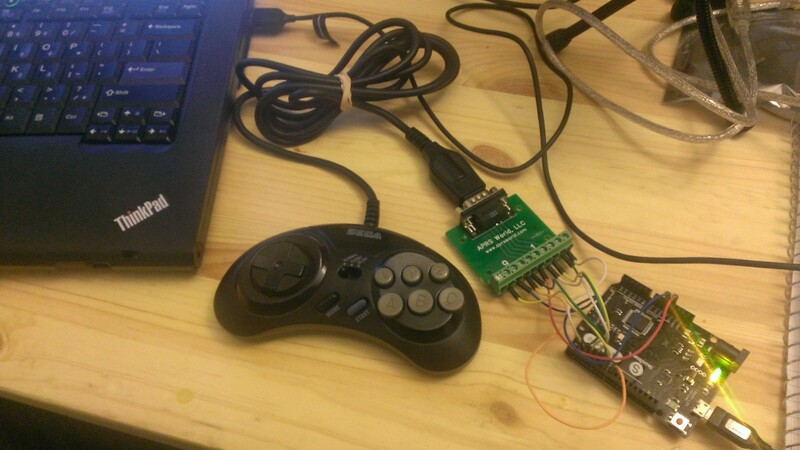 As I’ve mentioned before, the Sega Genesis was my first and favorite childhood gaming console, and though over the years I’ve come to rely on emulators, re-releases and clone systems to get my Sega nostalgia, I recently decided to set up some original hardware. Whether you’re new to the system, or a long-time fan, the holy trinity is to get a Sega Genesis along with its two biggest add-ons, the Sega CD and the Sega 32X. Now, one of the major annoyances is that each has its own wall-wart power supply, which are a pain to use: they’re hard to get situated on power strips due to their size and they generate a lot of heat, even with nothing turned on. The Sega Trio, which is a commercial power supply made specifically to solve this problem at the reasonable cost of $28.99. Only problem seems to be the very limited availability. Follow what others have done (see this forum post), and build my own custom harness on top of a generic power supply. So I decided to build my own, and document the build along the way. Now the next step is to find a suitable generic power supply. It is important to note that none of these systems actually needs exactly 9 or 10 volts to operate. In fact, the rating on the label is more like the “average voltage” that adapters of that model produce. 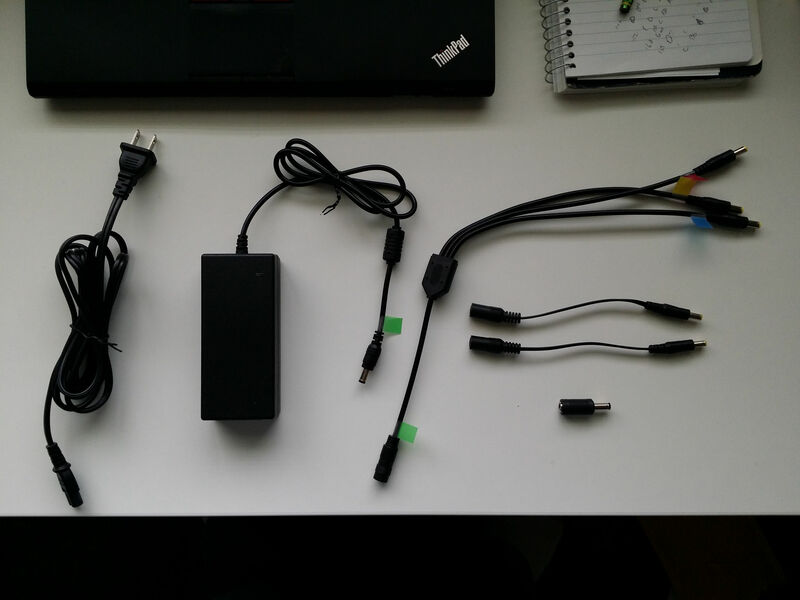 So a particular one of these power adapters may actually produce anywhere from 8 to 12V. This is all fine because the first thing each system does is step down that input power to the steady 5 volts that the chips inside are designed to use. Since it’s very easy to source 9V power supplies, I’ll go with 9V for my generic. As for the amperage, I need to add up the ratings of each power supply to get a minimum safe value. Amperage ratings show the maximum amperage that the power supplies can safely provide, not the actual amount the systems will necessarily draw. To be safe, OEM manufacturers typically provide power supplies that can offer slightly more amps than they expect their product to draw at full intensity. So in the original setup, 2.9A is probably safely above the maximum current I’d expect the three systems to draw at once. Round that up to 3A, and now I’m looking for a 9V, minimum 3A power supply, preferably one that isn’t a wall-wart. The next consideration is how to get one power supply to have three plugs. So I’m going to need to make or buy some kind of harness to split or daisy-chain three separate plugs. As for the plugs themselves, I have couple of things to consider. Generic power supplies typically come standard with barrel plugs with a 2.1mm diameter center hole with positive polarity. The Genesis Model 2 and 32X both use the more common positive polarity center. Unfortunately, they use the less common EIAJ-03 barrel plugs with a smaller 1.7mm diameter center hole. The Sega CD Model 2 uses the common 2.1mm center hole, but the less common negative polarity center. So in both cases I’m going to need some adapters. At this point I have a spectrum of options. On one end is to buy all raw parts and try to solder up a completely custom harness. More extreme, I could even build my own power supply from scratch. On the other end of the spectrum is to try and get away with buying off-the-shelf cables and adapters. Building from scratch is fine if you have the time, skills and tools. To save money you’ll need to buy parts in bulk, which is great if you’re going to build a bunch, or might use the parts in other projects. Anyone can buy off-the-shelf parts and just plug them all together. No special skills required. But you will pay a premium. 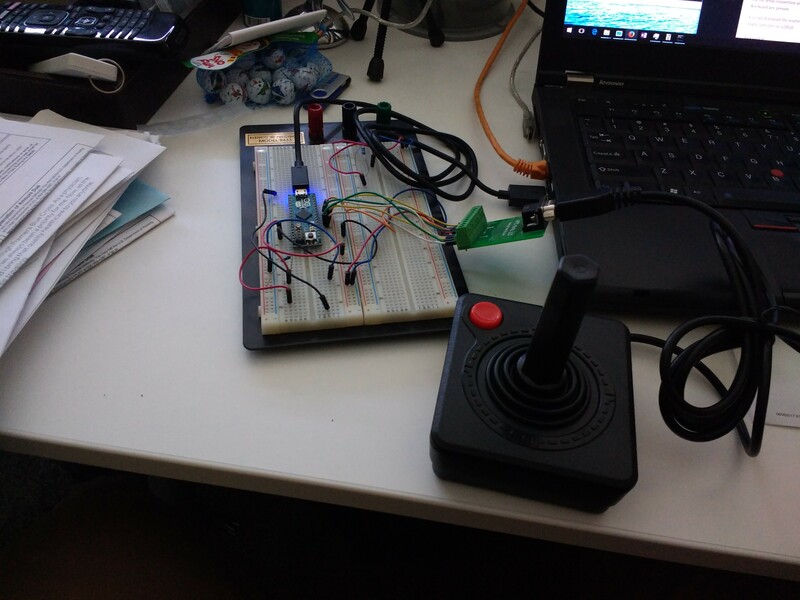 For this project, I thought it would be interesting to source off-the-shelf parts, just to prove that I could make it work with no soldering required. Yes it probably wouldn’t look as slick, but anyone could replicate it. Also I was feeling lazy. I can always play cable doctor later and transform the off-the-shelf parts into a slicker, more permanent solution. First off, I’ll say that I didn’t spend a ton of time sourcing the parts. Just a couple days casually browsing Amazon and Ebay. If I found something that looked like it’d work, I bought it. For $40, this is definitely not the cheapest way to do this, but it’s not much worse than buying three new power supplies at $9.99 each. 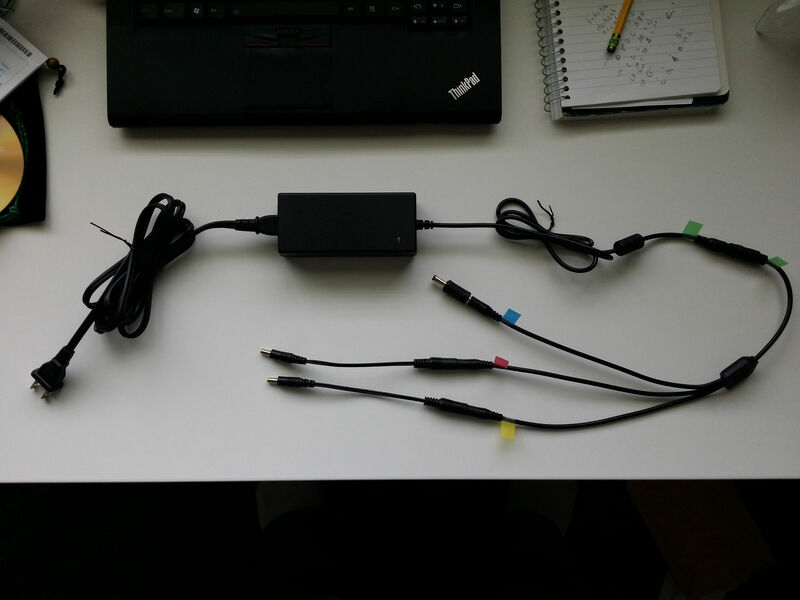 The nicest thing was finding out that the CCTV security camera market supports an industry of nice DC power cable splitters in a variety of configurations, which was the part I assumed I’d have to make myself. Connect AC cord to the power supply. Connect the 3-way splitter to the power supply. 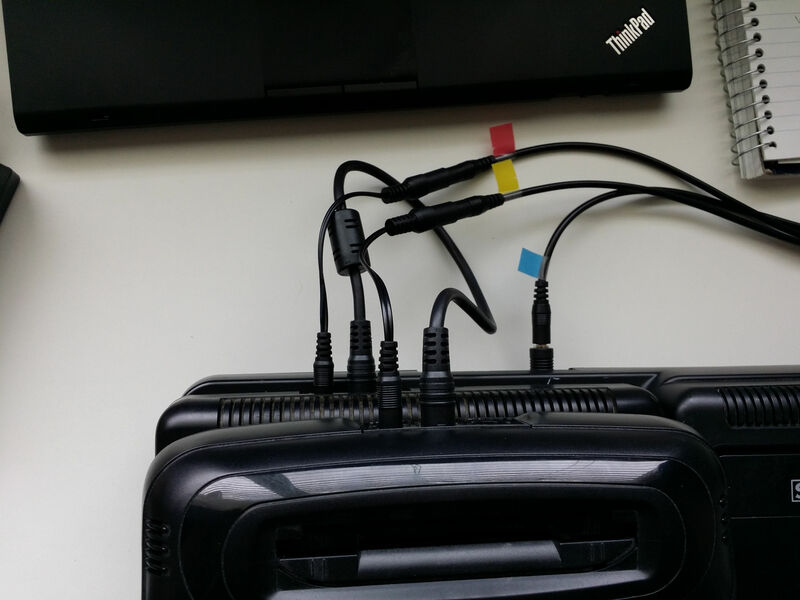 Connect each of the two 2.1mm to 1.7mm adapter cables to a cable coming out of the 3-way splitter (one each for the Genesis and 32X). Connect the 2.1mm polarity changer to the remaining cable coming out of the 3-way splitter (for the Sega CD). Since the plugs have different sizes, it shouldn’t be too hard to figure out which plug connects to each system. For the sake of simplicity, I put a bit of colored tape on each: red for Genesis, blue for CD, yellow for 32X, corresponding with the primary colors of the game boxes for each system. The power supply works like a charm. I’m free from the three-wart tyranny! Have questions or comments? Sound off below.